When the timing lever is up - fully retarded - what should be the position of the little lever on the lower end that connects to the timer? Dennis, what year is your car. That dimension is different in the '09-10 cars with the brass two-piece timer. The bend on the timer end of the timer rod goes inward on these cars and outward on the later cars. This is the most important dimension for the overall performance of your engine. I suggest that you arrive at your setting based on piston position. This critical setting can vary from one make timer to another and wear has to be taken into account. for both early and late T's. Lee - Thank you for your answer. My concern is with the position of the small arm on the end of the spark lever. It does not seem to move in the correct fashion to change the spark advance. Here are some photos to help you understand my question. The first shows the position of the lower arm when the lever is in the fully retarded position. Notice that the arm is at about the 2:00 position when viewed from the front. 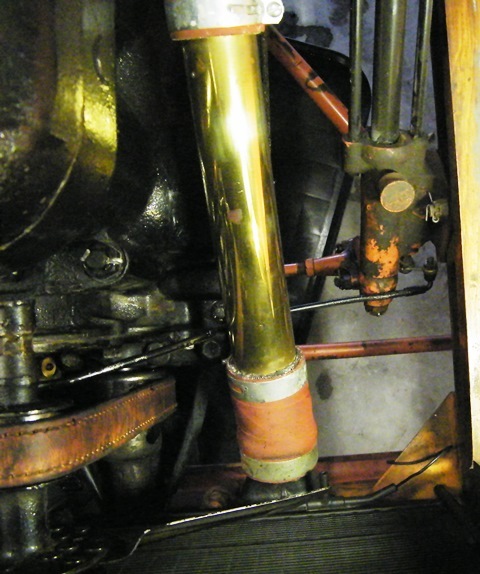 The second photo shows the position of the lower arm when the lever is in the fully advanced position. Note that the arm is now at about 5-6:00. This is directly below the retarded location and provides the same distance from the timer as the upper position. Is this arm in the correct position? Pat - 12:00 or earlier would make sense. Then the rod would be pulling as it was moving to advance. How do I move the lever? Aren't those arms pinned on the shaft? Is your's somehow turned around and therefore placing the pin in the incorrect position. I'm about 1700 miles from my model T's right now but I'll be interested in the answer. August 1911 factory drawing of the part shows the angle of the hole in relation to the lever upper end by a view looking at the end of the long shaft with the lever shown in the vertical position. The short answer to your original question is noon (or midnight). Seeing the question, I went out and looked at four vehicles. Two of them happen to have their timer rods off. On all four, the fully retarded position of the little lever is twelve o'clock (or maybe a minute or two after). With the timer rod missing, it will go down to about four, but with it in place the limit of downward travel is three o'clock. As you pointed out, anything past three would be superfluous, as it heads back toward the timer. John - Thank you that is just what I was looking for. I appreciate the size DOB 5/10/1943. I would almost guess that at some point the timer itself, the connecting rod, or something else got hung up and when someone forced the lever up it twisted your spark rod. Pat - I am sure that you must be correct. The hole in my spark rod is about 90 degrees to the left of the center line instead of 21 degrees to the right. I checked another rod - one that I chose not to use and it is in a straight line with the upper end. It looks like i better drill a new hole. I thought I would bring this back to the top because my Advance Rod Lever was over the 12 O'Clock Position (Maybe 10 or 11 o'clock) and hitting the Pitman Arm. So on a 1922 Touring the pin hole should be at 21 degrees from noon so maybe about 1 O'Clock or so? It should look like this at full retard. 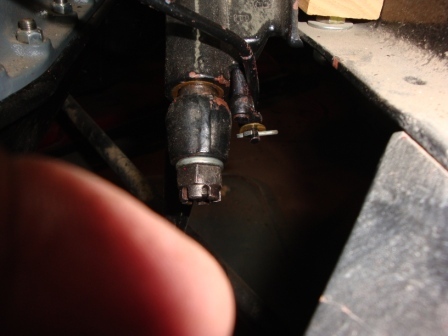 The timing lever goes under the water inlet pipe. I like that brass water pipe Royce. I really debated getting one a few weeks ago but now I see I'm going to need one. 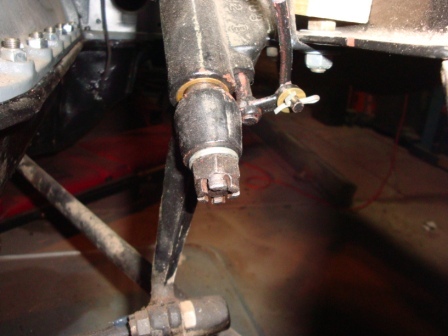 I would like to add, that the earlier cars have the lever bent, so when installed on the car, the hole for the commutator rod is horizontal, and the swivel joint will just drop into the top, not upside down like in Royces picture. I'm looking at the photo of that part in a 1917 parts book, and it appears to be the bent type, but it's hard to tell. I noticed too, the adjustable end for the throttle rod is still pictured, but is not listed, so they must have dropped it by then. 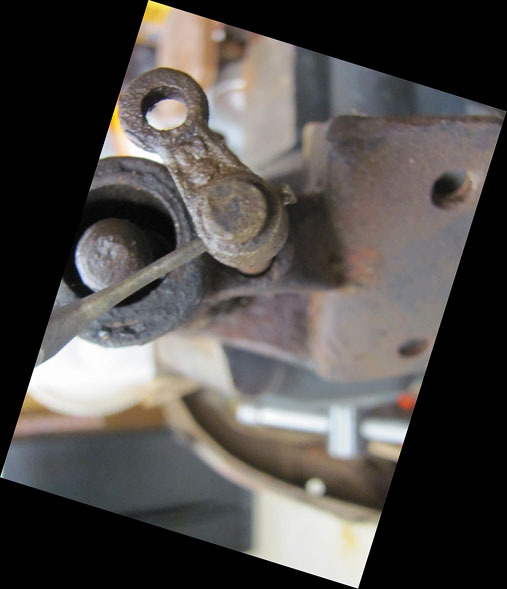 I am looking for the correct position of the little pinned lever arm at the end of the Timing rod from the steering column. My little pinned lever hits the pitman arm just as the timing rod reaches full retard stop at the quadrant. I thought I should fill in the hole and re-drill it to the proper location. Is the 21 degree drawing shown a few posts above, correct for the 1922 Touring? If your little pinned lever hits the pitman arm just as the timing rod reaches full retard stop at the quadrant you should be good. If you were to rotate the lever so that there was a space between the pitman arm and lever then your would limit the amount of moment at full advance. I think you are just right now. It doesn't seem right to me that it would hit the Pitman Arm. That drawing shows 21 degrees which also seems a bit far the other way. I guess I am wondering if that drawing applies to the 1922 as well? Where is everyone else's Lever Arm stopping at full retard and full advance? Is it 12 O'Clock to 4 O'Clock or something else. 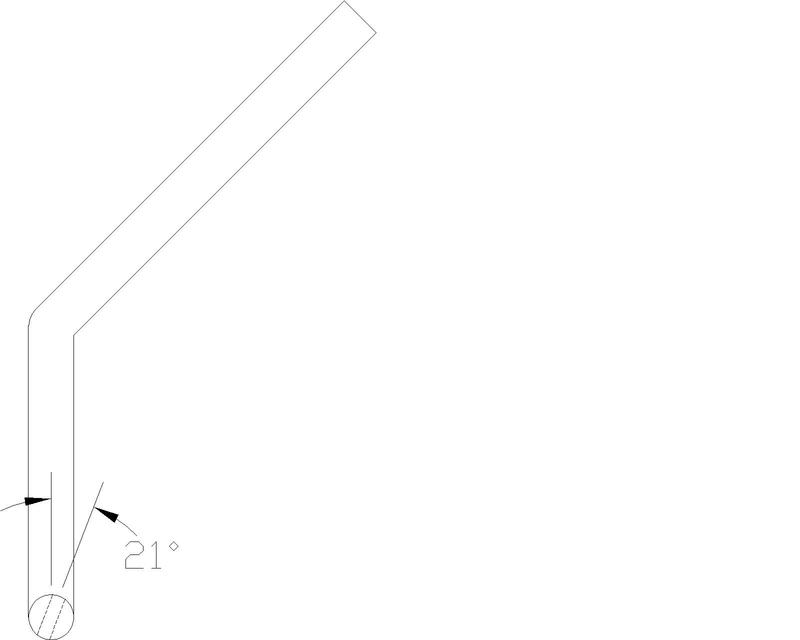 Based on John's drawing the lever would be close to the 11:00 position when viewing from the front when fully retarded. My 26 is between 11:00 and 12:00 and is very close to the steering shaft when fully retarded. This photo pretty much shows were it would be at full retard. Ok I guess I was looking at the drawing wrong. I was looking at the drawing as if the rod was in the fully retarded position in the car, not as if the rod was laying flat on a bench.